Making homemade stamps for kids is super easy when you can simply use things you have around the house; making it an awesome fun craft activity. In this instance, Chloe (my 4 year old) and I decided to use an apple and create a pumpkin painting. 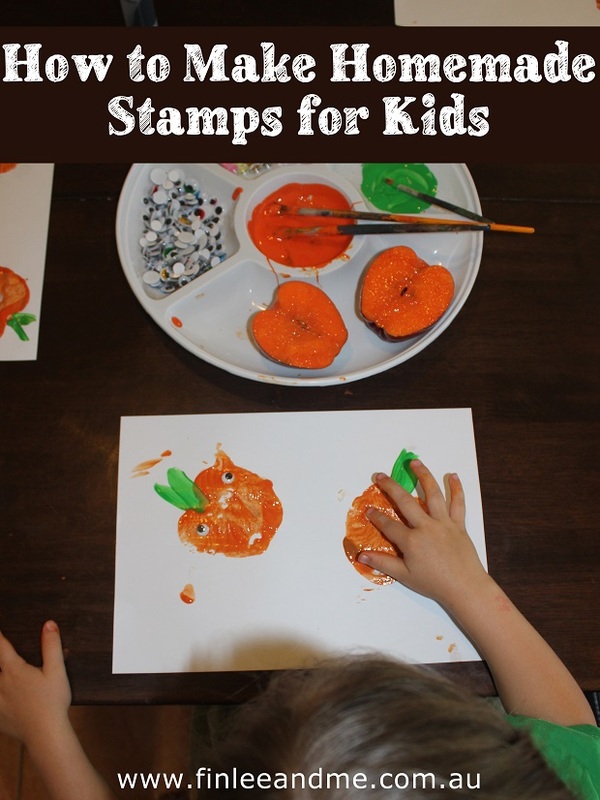 This would be a great kids activity to do near Halloween or you could just make the stamp again when it is closer and do some Halloween decorating. With our apple, Chloe and I decided that when it was cut in half it reminded us of a pumpkin so we chose our paint colours to match that and what better way than to jazz up a pumpkin than with eyes, a smiley face and some glitter. Step 1 – Cut your apple carefully in half. Depending on your child’s age it may be best if the adult does this. 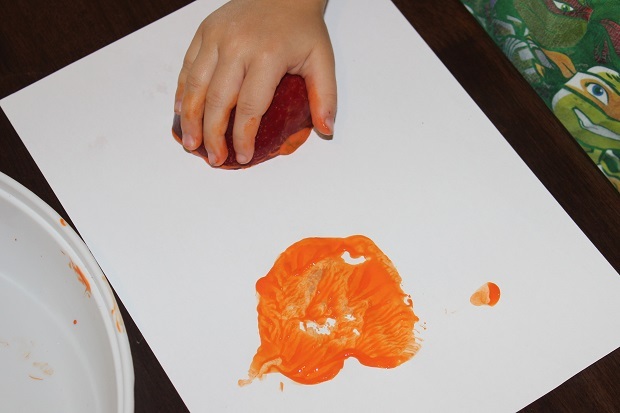 Then using the paint brush and your orange paint apply the paint to the apple. Step 2 – Then press the apple painted side down onto the paper. Depending on how much pressure and paint applied will depend on what sort of finish you get. You should be able to do multiple presses before repainting your apple normally. Step 3 – Using the green paint you can paint the pumpkin stem on. You could either use a paintbrush or your finger. The choice is yours! Step 4 – Before the paint dries sprinkle some glitter on if you wish and then add your eyes. Once the paint has dried you can draw on your smiley face and your pumpkin paintings are finished. Creating with your kids is a great fun way for them to learn and expand their imagination. This fun craft activity is great for colour recognition as well as their imagination as you discuss the shapes and patterns your pumpkin apple stamps create. You could use the opportunity to talk about different emotions to depending on your child’s age. What does happy look like, sad, angry, etc and how do they make you feel? Other foods you can also use to make homemade stamps are potatoes, carrots and celery stalks and other things you can make are greeting cards, gift bags, or even decorate fabric bags and t-shirts. If you do decorate fabric items though just make sure you use fabric paint and follow the directions so if you need to wash them it lasts. So what awesome homemade stamps have you made with your kids? We’d love to hear what fruits and vegetables you used and send us some pictures of what you made or decorated.